Impressive new Masonic buildings are rarely erected these days. With a few notable exceptions, sadly, most new fraternal buildings anymore are little more than a pole barn shed in a cornfield. So it's a pleasure to see a Masonic organization building a new fraternal landmark with the kind of love, vision and detail that were the hallmarks of our predecessors. By all appearances, Minnesota Masonic Charities isn’t cutting corners on its new 50,000-square-foot Heritage Center in Bloomington. The $22 million center is taking shape on the nonprofit organization’s 83-acre wooded campus at 11501 Masonic Drive. 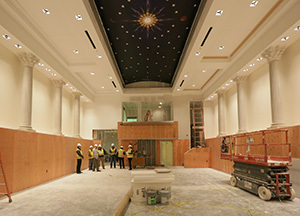 When it opens in June, it will house a 425-seat auditorium, a Masonic museum and lodge, a library with rare Masonic books, and event spaces. Designed by Trossen Wright Plutowski in Robbinsdale and built by St. Louis Park-based Adolfson & Peterson, the building will offer a high level of finishes from the porcelain floors and restored stained glass to the barrel-vaulted ceilings. It hasn’t been cheap. Since last spring, the budget has grown from “north of $15 million” to “closer to $22 million,” said Keir Johnson, director of the Minnesota Masonic Heritage Center. Much of that extra cost stems from an increase in parking and additional restrooms in the event level, as well as upgraded interior finishes and fixtures, Johnson said. 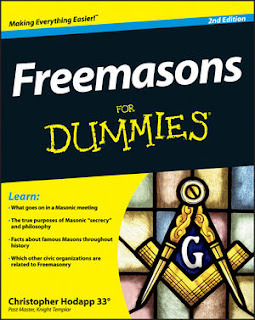 But Johnson said the project is being “funded internally” by the Masons and isn’t dependent on any additional money. Minnesota Masonic Charities officials say there are “very few” centers like it in the country. 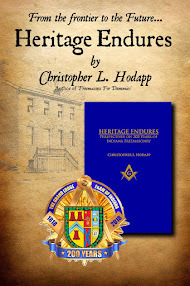 It will be available for community events as well as Minnesota’s 12,000 or so masons. 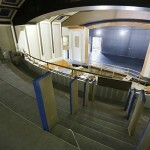 During a tour of the project Tuesday, the sights and sounds of construction were palpable. Visitors in hard hats walked on dusty floors past pallets with newly delivered materials, and rows of drywall stacked against unfinished walls. Patrick Sims, senior pre-construction manager for Adolfson & Peterson, said during the tour that he hasn’t seen anything quite like this project in his 21 years in the industry. The new Col. James B. Ladd Masonic Museum will tell the history of Freemasonry. Johnson said it will increase space to display some of the 60,000 Masonic artifacts currently in storage. The Alfred E. Ames Lodge room, featuring pillars along the walls and Masonic symbols, will host Masonic gatherings and allow people to “see what a real Masonic lodge looks like,” Johnson said during the tour. Elsewhere on the main floor, the Charles Nelson Library will include a stained glass window salvaged from a Masonic lodge that closed a couple of years ago in Virginia, Minnesota, Johnson said. The Gaytee-Palmer Stained Glass Co. in northeast Minneapolis is working on the window. Johnson said the same company is creating a new 18-foot-high stained glass window for a rotunda area just off the main lobby. The new window will feature Masonic symbols and a reproduction of a work by the English painter William Blake, he said. Another Minneapolis artisan, Nicholas Legeros Inc., is making 14-foot high bronze pillars, which will flank doors on the building’s exterior. “We are using a lot of local artisans,” Johnson said. Alan Plutowski, principal architect at Trossen Wright and Plutowski, said in press materials that the building will have “openness” and will be inviting to the community. “The quality of materials, beauty and design of stone and brickwork really represent concepts from the gold age of architecture,” he said. In all, 30 to 50 tradespeople have been working on the project, which is on target to open on June 24. That’s the anniversary of the formation of the Grand Lodge of England in 1717 – an “important date” in Masonic history, Johnson said. Famous Masons in Minnesota’s history include James J. Hill, the Mayo brothers and Hubert H. Humphrey. Two obsolete infirmary buildings were torn down to make way for the new center. The center is attached to the Minnesota Masonic Home, an elderly and transitional care facility. The campus has 56 independent living townhomes, 45 assisted living units, and 214 skilled care beds. To support the new Minnesota Masonic Heritage Center, naming rights are now available for the 425 seats of the Gideon S. Ives Auditorium. Name a plush auditorium seat after yourself, your organization or as a gift or memorial to someone else. Each seat is $250, and seat sponsorship is honored for the life of the chair. Click here to download a reservation form.